24me‘s smart assistant that helps users remember to pay bills, send birthday cards and make important calls may well have been available to iOS users for nearly two years, but Android owners have been left out in the cold until today’s official launch of the app for Android devices. OK, so it’s not exactly the first time we’ve seen the Android build – the company launched a ‘rough around the edges’ beta alongside an iOS update back in September – but now it’s ready for the prime-time and is freely available to download for all. The full build, like on iOS, focuses on bringing advanced task management functionality first and foremost. It does this by connecting to a range of your accounts – social networks, service providers, financial institutions etc. – and then generates reminders from all of this information automatically. 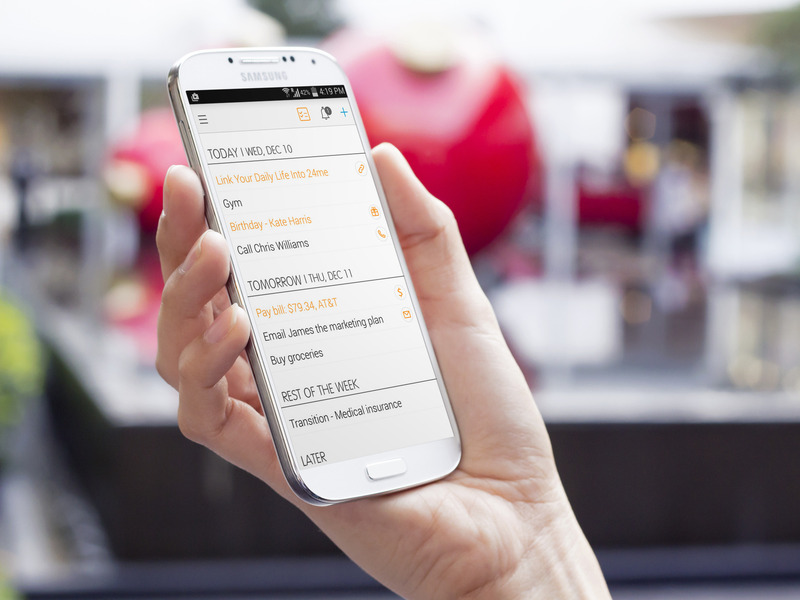 These reminders then present an ‘action button’, allowing you to carry out tasks quickly and easily. To streamline things like sending birthday gifts/cards or getting your errands done, there’s an in-app gift store from which you can directly dispatch a present and an errands marketplace that connects you to professional services. Things will be a little easier for users in the US, who will able to start integrating financial and service accounts straight away, but users in other parts of the world will need to set these up manually. While it’s certainly a lot more fully-formed than the version we saw earlier in the year, it’s still not quite on par with the iOS build as the Calendar and Notes features are still absent. However, these should follow along in the next few months, the company told TNW.